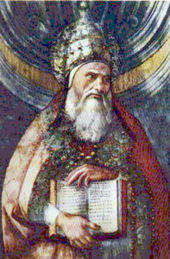 Pope Saint Pius I was bishop of Rome for about 14 years during the mid-second century. His dates are uncertain due to conflicting sources, with beginning dates ranging from 142 to 146 C.E. and ending dates ranging from 154 or 161. Pius is believed to have been born at Aquileia in Northern Italy, during the late first century. His father was called Rufinus, and he was the brother of Hermas, author of the apocalyptic text known as The Shepherd of Hermas. During Pius' time, the Roman church was visited by various well known teachers such as Justin Martyr and the heretics Marcion and Valentinus. The second century writer Irenaeus of Lyons indicates that Pius excommunicated Marcion, and later sources say that he provided for Jewish Christians to rejoin the church if they recanted their "heresy." Once considered a martyr, Pius is no longer commemorated as such in the Roman Catholic Church. His feast day is July 11. Pius I was a leader the Roman church in the middle of the second century, during the reigns of the Emperors Antoninus Pius and Marcus Aurelius, although it may still be too early to speak of him as a "pope" in the sense of single ruling bishop of Rome, and the term "pope" was certainly not yet used by the bishops of Rome themselves. Pius is one of the first early Roman bishops for whom we have a some biographical details beyond where he came from and the name of his father. The second-century Muratorian fragment indicates that he was the brother of Hermas, the writer of the apocalyptic text known as The Shepherd, which urged the church to purify itself in preparation for the imminent Second Coming of Christ. Since Hermas identifies himself as a former slave, it is presumed that both Hermas and Pius I were freedmen. Marcion, who was excommunicated by Pius I, displaying his canon of Christian scripture. During Pius' time at Rome, Justin Martyr taught his version of Christian doctrine there and the "heretics" Valentinus, Cerdon, and Marcion were also active. Valentinus was perhaps the best known Gnostic teacher of his day. He was already active in Rome during the time of Pius' predecessor Hyginus and continued to teach his doctrine during the time of Pius. Cerdon, whose teachings anticipated those of Marcion, was also active in Rome during this time, and Marcion himself also arrived in the capital in this period. Bishop Ireneaus of Lyons indicates that Marcion was excommunicated by Pius (Against Heresies III.3), after which Marcion, a wealthy shipbuilder, was able to sustain a separate congregation centered on his doctrine. The Christian community in Rome thus seems to have been emerging at this time as an important center of Christian life and controversy. The Liber Pontificalis indicates that Pius instituted a policy to allow Jewish Christians to be accepted back into the church if they renounced the "heresy" of Judaism. Although this source often attributes policies to the popes anachronistically, in this case other circumstances make this attribution more plausible. For example, Justin's writing indicate strong anti-Judaistic feelings among the Roman Christians, and Marcion's doctrine specified that the Old Testament scriptures were not valid because the Jewish deity who inspired them was an inferior, wrathful being, very different from the True God who was the Heavenly Father of Jesus. In any case, it is probable that during Pius' time, the church was forced by teachers such as Marcion to face the question of whether the Old Testament scriptures were inspired by the Christian God. 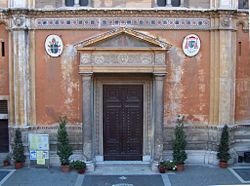 The church of Santa Pudenziana in Rome. A later legend places the foundation of two major Roman churches, the Santa Pudenziana and the titulus Praxedis, to the time of Pius. Both Catholic and secular scholarship, however, currently hold that these two churches, as such, came into existence in the fourth century. It is possible, however, that these later buildings replaced Christian house churches that had been in operation during Pius' time. A tradition also exists that Pius died as a martyr in Rome, and this tradition entered the early editions of the Breviary. However, he is one of the very few popes not identified as a martyr in the Liber Pontificalis, and the 1969 revision of the Roman Catholic Calendar of Saints stated that there are no grounds for him to be considered a martyr today. He is thus not presented as such in contemporary the Roman Martyrology. Pius I's feast day is celebrated on July 11. In the Tridentine Calendar it was celebrated as the feast of a martyr. The rank of the feast was reduced to a Commemoration in the 1955 General Roman Calendar of Pope Pius XII and the General Roman Calendar of 1962. Though no longer mentioned in the General Roman Catholic calendar of saints, he may now be celebrated on his feast day with a "memorial." By excommunicating Marcion, Pius established the Christian tradition to recognize the Jewish and Christian deities as one and the same God and created the foundation for accepting the Old Testament into the later Christian canon of scripture. 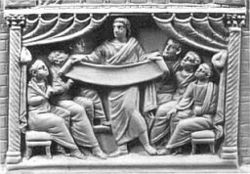 In his time, the Roman church appears to have begun to assume a defining role in establishing Christian doctrine, not only by later reputation, but also in actual practice. ↑ ACBC, General Instruction of the Roman Missal, 355 c. Retrieved December 25, 2008. History of "Pope Pius I"
This page was last modified on 4 May 2015, at 15:32.